Whichever the reason Black or White simply wasn’t as successful as perhaps it could have been and, between the storyline and the talent, it is a shame it won’t be a more memorable movie. 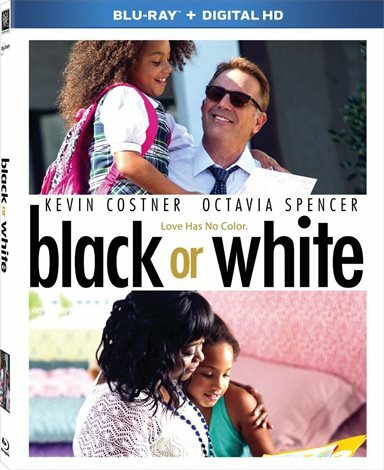 When Black or White came to the FlickDirect office for review I couldn't figure out how I missed a movie starring Kevin Costner (Field of Dreams, Draft Day) and Octavia Spencer (The Help, Insurgent). Two powerhouses headline a film directed by Mike Binder (The Upside of Anger, Reign Over Me), what could be bad? Turns out there is a reason it didn't have much promotion or hype. Black or white tells the story of a grieving widower fighting for custody of his half black granddaughter. Elliot Anderson (Costner) lost his daughter about 10 years ago during childbirth. Then his wife gets killed in a car accident and he must raise their granddaughter on his own. However, when the girl's paternal grandmother, Rowena Jeffers (Spencer) decides Eloise (Jillian Estell; Chase) belongs with her family and the drug addict father she barely knows, a court battle with lots of accusations ensues. Underlying the story is the current of racial tension perpetuated by all parties involved including Rowena's Attorney brother, Jeremiah Jeffers (Anthony Mackie, Captain America: Winter Soldier), Rowena and Elliot. There is also an air of hypocrisy as Elliot lambastes Eloise's father for his drug addiction when Elliot himself can't seem to truly get his drinking under control. The acting is very good and Costner and Spencer both turn in performances worthy of the weighty subject matter. Estell, in her first major role, exudes a maturity that belies her age. Her portrayal of a young girl dealing with heartbreak and confusion while still trying to grow up enhances the film and is necessary to make the screenplay work. Mackie is over the top as the stereotypical successful black man with something to prove and his performance suffers a little because of it. The plot may seem unrealistic to many and won't necessarily appeal to the masses but I happen to know someone who is dealing with a similar scenario and, while watching the film, I thought to myself they could have simply made a reality show about his life. The ending is predictable and ties things up neatly which doesn't particularly work since real life isn't nearly so tidy. Adding to that the racial tension of this film perpetuates all the stereotypes and doesn't offer anything refreshing or new. While it was a bold choice to make this film I'm not sure it adds anything to the current culture in this country. The Blu-ray has 1080p video quality and the picture is sharp, focused and doesn't detract in anyway form the story. The DTS-HD Master Audio 5.1 is what you would expect but, to be honest, in a film like this one the audio isn't as important as the plot and the performances from the actors. Download Black or White from the iTunes Store in Digial HD. For more information about Black or White visit the FlickDirect Movie Database.